Hunter Douglas linear wood ceilings are available in solid wood or with a wood veneer finish. We also offer a metal woodprint that has the structural integrity of our metal ceilings with a beautiful wood effect finish that is ideal for larger building projects. 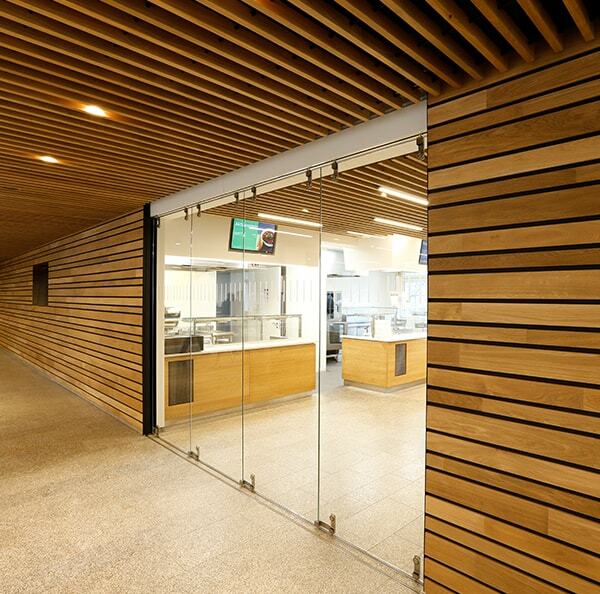 All linear wood ceilings are environmentally friendly. 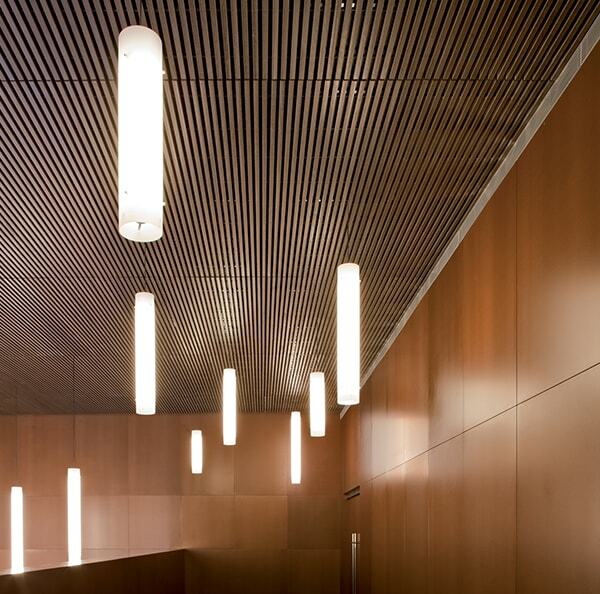 The metal wood print ceilings are Cradle to Cradle™ level Bronze certified. Linear wood ceilings are the only building material that is completely CO2 neutral and totally recyclable. Linear Ceilings can also be optimised in dimension and shape to suit specific project requirements. The Hunter Douglas linear wood ceiling system consists of wooden panels with pre-fixed clips, that allows them to be easily fixed onto the carrier. Various panel widths can be combined in tandem to create a completely unique look. The system is easy to install and is fully demountable for ease of access to the plenum. The Hunter Douglas linear wood ceiling system is a made-to-measure solution that is fully supported on site. The system requires no cutting adjustments on site which significantly reducing the installation time and cost. A multitude of designs are possible as the panel and gap size is fully customisable. A wide range of wood species can be specified, all with their own specific characteristics. The metal woodprint ceiling is available in five different woodprint designs. Budget and design flexibility is achievable due to freedom in both slat size and gap. Stunning variations can be created with the change in wood species, veneer or finish too. 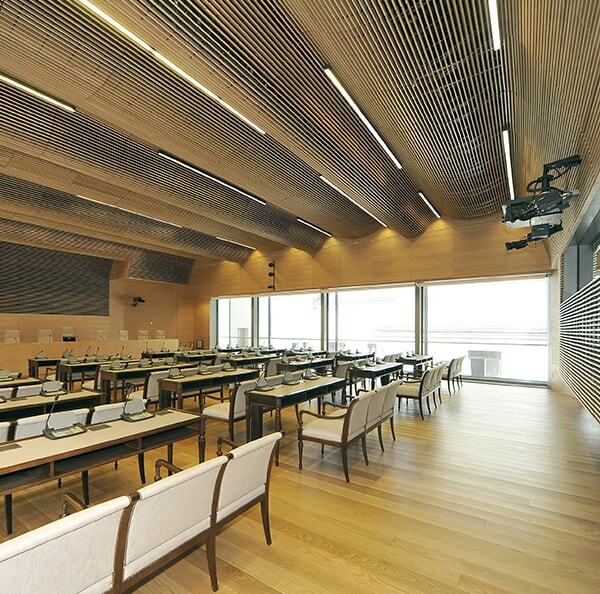 Linear Wood Ceilings offer high acoustic performance both with or without additional acoustic pads. Playing with the panel width and gap can provide the necessary acoustic performance for different atmospheres and environments. The panels can also be perforated as an option. Our solid wood exceeds 20 different species each with their own unique characteristics. They are then finished as standard with high-quality varnish to protect the wood against moisture, dust and dirt. Other wood species may be available on request. Alongside the standard transparent varnish, there is also a wide range of stains and colours available. This finish can add a nice touch to the wood. Our veneered systems exceed 40 veneers to create the ideal ambiance and feel. These panels are then provided with a transparent lacquer but if a special look is required, special varnishes, staining or paint finishes are also possible. Upon request it is also possible to slip-match or miss-match sheets. Depending on how the veneers are matched, a significant design is created. 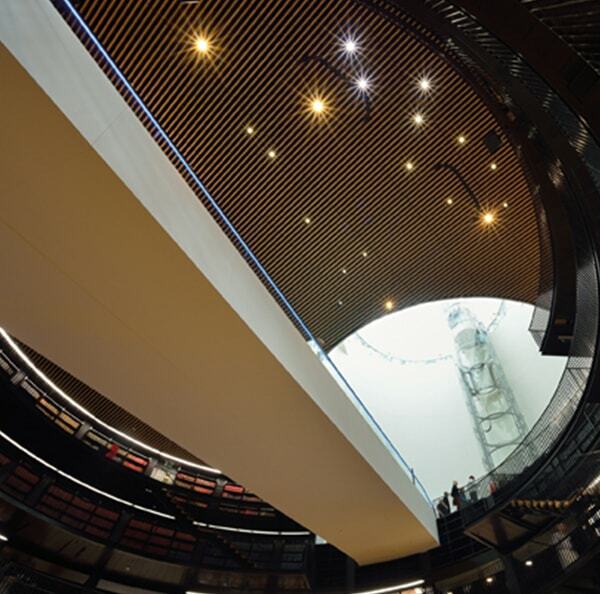 The Metal Woodprint ceilings are standard available in five woodprint finishes, Palisander, Pine, Cedar, Oak and Birch. Special finishes and colours for projects are available upon request. Our focus on quality (ISO9001 certified) ensures the highest standard of production processes, material, machinery and finished product. The superior durability of Hunter Douglas products translates into lower costs during the life cycle of the product. Due to a special treatment of the wooden panels, some wood species are perfectly suitable for humid areas, such as swimming pools. Reaction to fire classification B-s2,d0 according to EN 13501-1 for solid wood and B-s1,d0 for veneered. A higher classification of A2,s1,d0 (plain) or A2,s2,d0 (acoustic version) is available in metal woodprint. 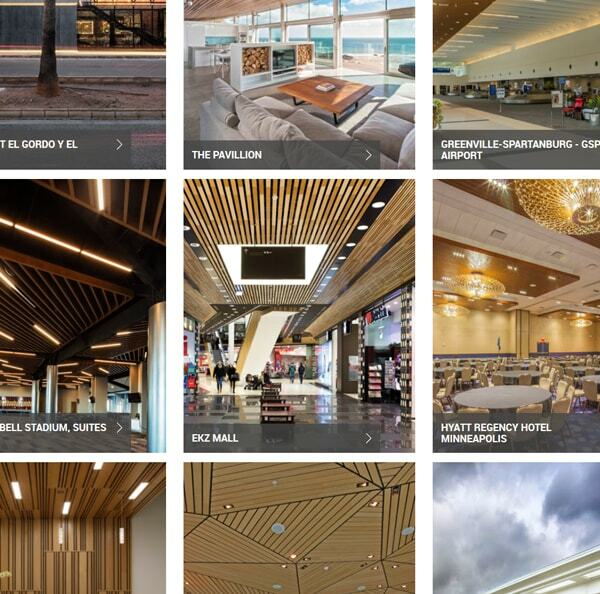 Be inspired on our project gallery with linear wood ceilings. Click on the photo for more information. Use the filters below to browse our full selection of Linear Products.